The EnviroVAr power factor correction provides effective reactive power compensation for all industrial, commercial and large retail environments where excess charges are being applied and or where current availability is limited and the cost of a replacement transformer or increased supply is prohibitive. Most three phase electrical loads draw not only active power (kW, the part that does useful work), from the supply, but also reactive power (kVAr, essential, but ‘Wattless’ power); examples of these loads would be induction motors, motor drives (both AC and DC ) , switch-mode power supplies, and most forms of lighting. 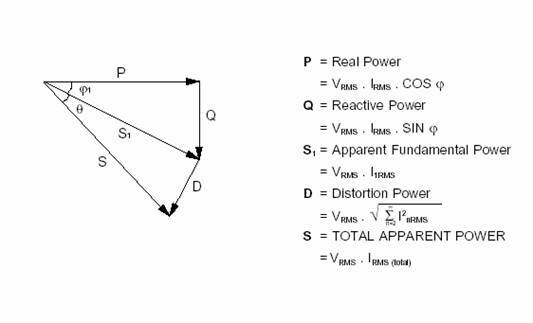 When seeking to improve the power factor of a load, what is actually being done is to supply a proportion of the reactive power demand of this load locally. 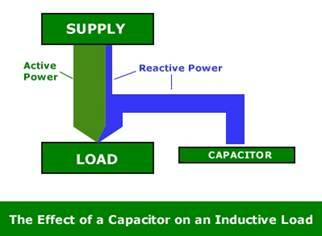 This results in a greater proportion of active current being drawn from the supply. To make a very crude example of an induction motor, the active power is what comes out of the shaft and does work, whilst the reactive power is what is used by the coils of the stator to create the magnetic field. This magnetic field is essential for the operation of the motor, but does no actual work, only permitting the transfer of power from the stator to the rotor. This is the ‘Displacement Power Factor’ or DPF, more commonly known as just the ‘Power Factor’ and only takes into consideration the frequency components of voltage and current. With no power factor correction equipment installed, the supply is required to provide the total active and reactive power demand of the load. 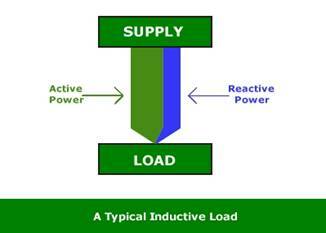 With a capacitor installed electrically adjacent to a load, the supply is required only to provide the active power demand, and a smaller proportion of the reactive power demand. Engineering Recommendation G5/4, (relates to planning levels for harmonic voltage distortion and the connection of non-linear equipment to transmission systems and distribution networks in the United Kingdom), is now enforceable legislation. The use of detuned capacitor banks has the effect of absorbing a proportion of any harmonic currents produced by the load, and can often result in compliance with G5/4 without the need for further harmonic reduction equipment. Engineering Recommendation P28, (relates to planning limits for voltage fluctuations caused by industrial, commercial and domestic equipment in the United Kingdom), details limits on ‘Voltage Flicker’. As the majority of flicker is caused by voltage drop due to sudden reactive power demand, the installation of power factor correction capacitors can reduce the levels of flicker to within acceptable limits without the need for supply reinforcement. Organizations having or seeking approval under ISO14001 (Environmental Management) can easily show increased electrical efficiencies and reduction in carbon emissions by implementing an appropriate Power Factor Correction scheme. Reduction in kVA required to supply a given kW load means that initial capital expenditure can be reduced, as the primary distribution network components (transformers, switchgear etc.) can be reduced in rating and hence Cost. Reduction in losses in distribution equipment due to reduced demand on the supply is reflected in the kWh usage for the site. Whilst this reduction in kWh consumption may at first appear to be small, it can amount to between 1% and 3% of the total consumption, with the associated savings in electricity charges. The tariff under which charges are made for electricity may include items which relate directly or indirectly to poor power factor. These are usually specific to the consumer, and hence generalizations are difficult. Items falling into this category which may be affected include Authorized Supply Capacity, Metered Monthly Maximum Demand, and Reactive Unit charges.